Sweet Cheeks Adventures is helping with promotion of this awesome giveaway. Good Luck! 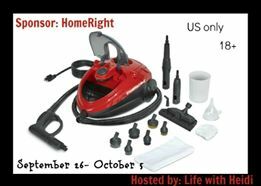 Welcome to this awesome giveaway of an AutoRight Steam Machine Giveaway hosted by Life with Heidi! If you haven't seen the review you can check it out here. Cleaning your vehicle is now easier with the AutoRight Steam Machine because it allows you to get your vehicle clean quickly and easily. The AutoRight SteamMachine only uses water and steam to clean which means less harmful chemicals in your home. That is a win, win in my book. Make sure you check out HomeRight on their website, Facebook, Twitter, Pinterest, You Tube and Instagram accounts! This giveaway will run from September 26- October 5 12:00 am est. Open to US Only and you must be 18 years or older to enter. One winner will receive an AutoRight SteamMachine Giveaway ! My kids and I love Strawberry Shortcake! I loved it when i was a kid and so do my kids! Thank you!